The first footage from the upcoming Shahid Kapoor starrer Kabir Singh dropped on the internet a few days back. The actor plays a rowdy doctor, who believes in smoking, drinking, swearing, smashing skulls as much as he does in medicine. Or so we suppose. From the tiny footage, it is evident that Shahid is going to impress with his performance once again (and fans will happily forgive him for Batti Gul Meter Chalu). Well, we and the fans are not the only ones impressed with the actor. Baahubali star Prabhas is also a member of this club. As per reports, Prabhas watched the teaser of Kabir Singh and loved it. Before we reveal the full story, we should tell you that Kabir Singh is the official Hindi remake of the Telugu film, Arjun Reddy, which featured, Vijay Deverakonda. Prabhas and Shahid spoke about the teaser and the remake for about 7-minutes, as per hairstylist Aalim Hakim, reports DNA. Aalim and Prabhas were working together when the teaser of Kabir Singh dropped. "I was in Hyderabad shooting for Saaho with Prabhas, and the teaser of Kabir Singh had just launched online. Prabhas checked it out and loved it. 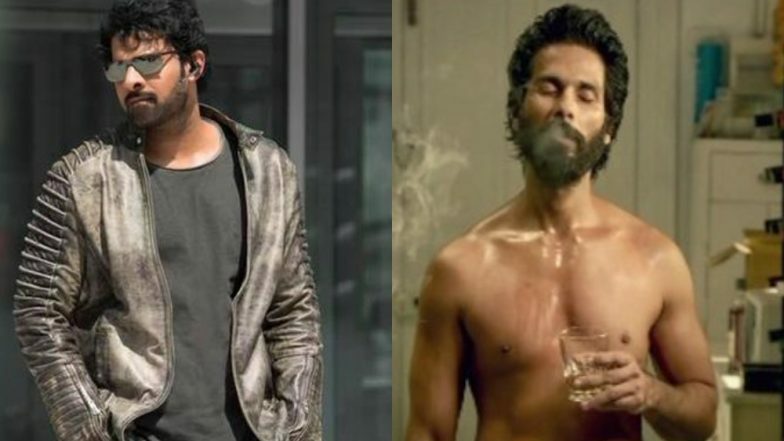 Even his team members, who have enjoyed Arjun Reddy, felt that Shahid looked brilliant," Shahid Kapoor Channelizes His Inner Kabir Singh, Ditches The Chiseled Body To Show 'Real' Self (View Inspiring Pic). Then it was Aalim who upon seeing this reaction, called up Shahid to put him touch with the South Indian superstar. "[Prabhas] praised him [Shahid] and said that Kabir Singh looks even better than the original. Both of them chatted for a good seven-odd minutes,” Aalim Khan revealed to the publication. Well, we are so happy to see hear about these two stars bonding. We know how reserved both of them are, so this must have been a rare moment. All said, we can't wait for the full trailer of Kabir Singh to drop online. Ok, enough chatter about Kabir Singh now. Let us also give a moment of attention to Prabhas' Saaho. The actioner is due to come out this year and we are eagerly looking forward to it also. Only minimal footage from the film has been released by the makers which were enough for fans to know that the movie will be a cinematic wonder.